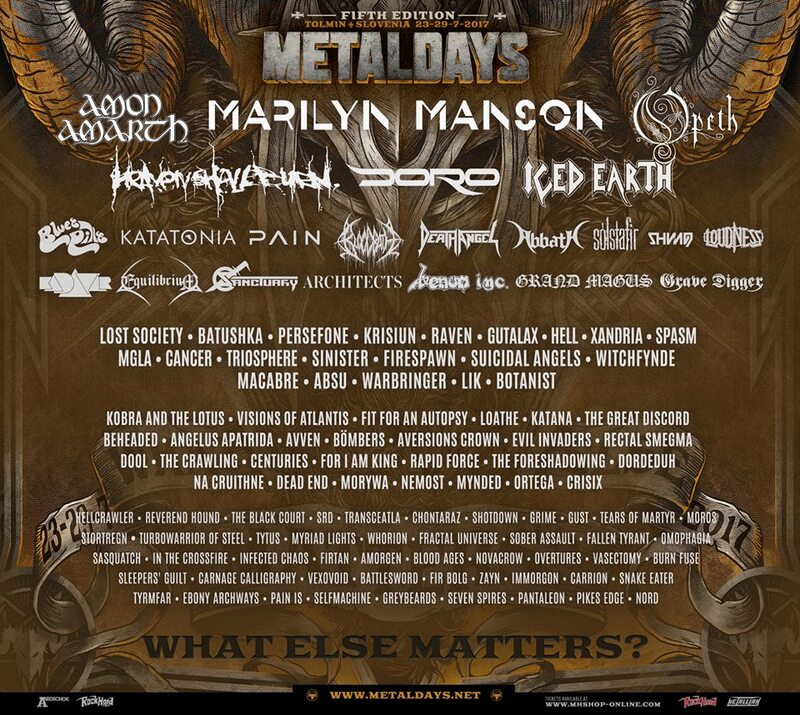 Това ще бъде MetalDays Festival, който ще се проведе за пети път между 23 и 29 юли 2017 в Толмин, Словения. Включени са повече от 110 групи… И този грандиозен лайнъп само на 1000 км. от София! Още участници: Marilyn Manson, Amon Amarth, Opeth, Doro, Iced Earth, Katatonia, Pain, Blues Pills, Bloodbath, Death Angel, Abbath, Shining, Loudness, Kadavar, Equilibrium, Sanctuary, Architects, Venom Inc., Grand Magus, Batushka, Persefone, Krisiun, Gutalax, Hell, Xandria, Spasm, MGLA, Cancer, Triosphere, Sinister, Suicidal Angels, Goathwhore, Witchfynde, Macabre, Absu, Warbringer, Lost Society, Kobra and the Lotus, Visions of Atlantis, Fit for an autopsy, Loathe, Katana, The great discord, Angelus Apatrida, Aaven, Aversions Crown, Evil Invaders, Rectal Smegma, Dool, Centuries, For I am a King, Rapid Force, The Foreshadowing, Dordeduh, Na Cruithne, Dead End, Morywa, Nemost, Mynded, Ortega, Crisix, Hellcrawler, Reverend hound, The black court, Srd, Transceatla, Chontaraz, Shot down, Grime, Gust, Tears of martyr, Moros, Stortregn, Turbowarrior of steel, Tytus, Myriad lights, Whorion, Fractal universe, Sober assault, Fallen tyrant, Omophagia, Sasquatch, In the crossfire, Infected chaos, Firtan, Amorgen, Blood ages, Novacrow, Overtures, Vasectomy, Burn fuse, Sleepers’ guilt, Carnage calligraphy, Vexovoid, Battlesword, Fir bolg, Zayn, Immorgon, Carrion, Snake eater, Tyrmfar, Ebony archways, Pain is & Selfmachine. 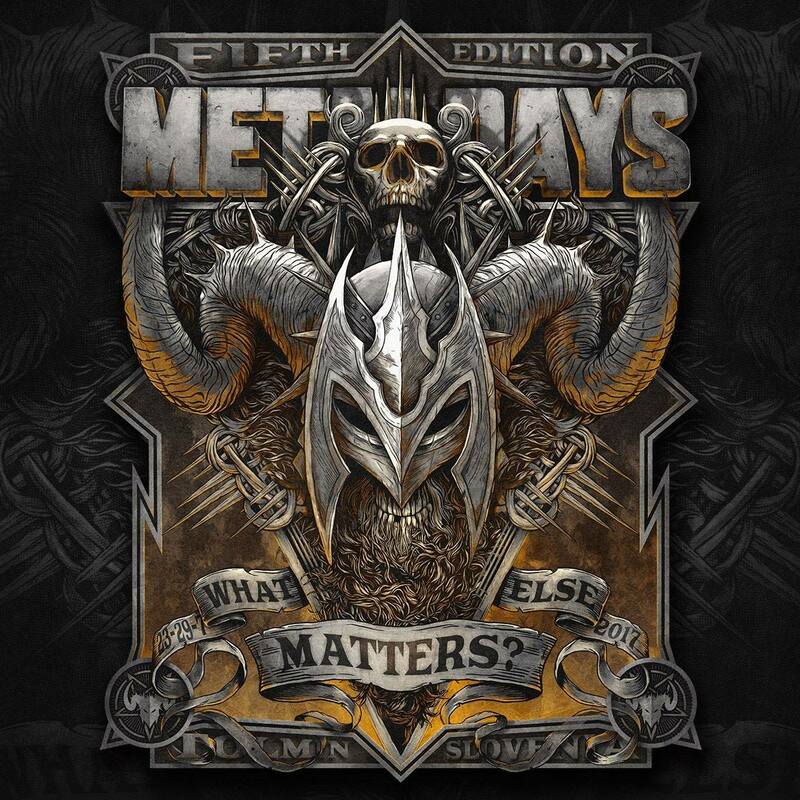 Тридневни и еднодневни билети са налични на адрес https://www.mhshop-online.com/c365/metaldays-2017.